The ‘BXL-NYC Spatialized’ Expo is an exchange between Brussels and New York, in which six audio artists (Mieke Lambrigts, Stefaan Quix, Ludo Engels, Barry Weisblat, Marina Rosenfeld and Michael Schumacher) show their work on sound spatialization in both cities. The Brussels’ leg of the exhibition was hosted at Koolmijnenkaai 30-34, in the Q-O2, okno and iMAL quarters in November 2011. 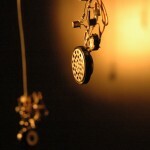 The spatial character of sound and the possibility of creating sound spaces culminate in the use of multichannel techniques. All six artists approach this idea from different angles. Mieke Lambrigts’ sound compositions are marked by a strong architectural focus, and she often resorts to site-specific installations. By amplifying and reverberating sound details back into a physical space, she manages to reproduce an environment within an environment, across time. Stefaan Quix uses space as a three-dimensional sound canvass (in contrast to space as a plane, in the case of stereo), using sound loops from the many monitors in the room to create an aural architecture. Ludo Engels, on the hand, literally takes a sculptural approach to the interaction of sound within a space: his audio points consist of hundreds of small (tangible) audio generators by means of which he literally designs the space. Across the Atlantic the three New York artists also each have their own take on multi-channel spatialization, from Schumacher’s acousmatic approach to Rosenfeld’s loudspeakers-as-objects and Weisblat’s loudspeaker-free sounding objects. Via their various approaches, all artists want to activate and stimulate listeners’ awareness of spatial properties.